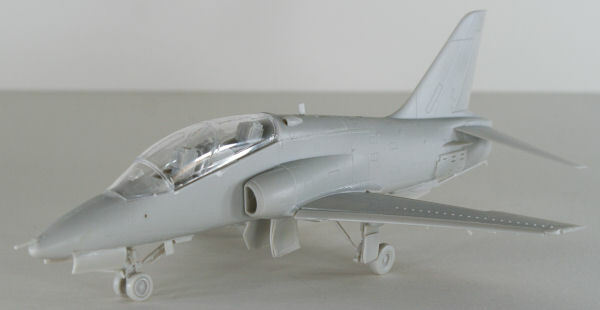 with the first set not only offering these very same markings as the TwoBobs, but also the Redhawk scheme which is the one I want to build. With that project in mind, I decided to do a quick-build to see what, if any, challenges might await when building this kit. 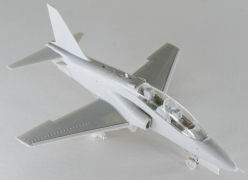 First, I am using Tamiya Extra Thin Cement for this quick build. 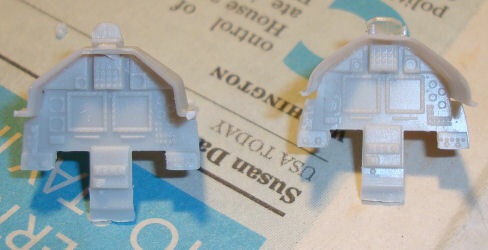 There is no use of putty, filler, cyano, paints, primers, or anything else. What you see is the kit coming together straight off the sprues with a little fitting and trimming. As you'll see in the images, I do use a few clamps here and there to help hold this project together as I am moving rather quickly through the assembly process. 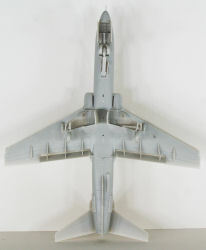 In the image above, you can see the cockpit, intake/exhaust, and landing gear subassemblies completed. The NACES ejection seats are a bit of a challenge to assemble as the sides of the headrest didn't want to fit quite right. A little trimming and dry fitting got them a little closer but if you're doing a static build, you might want to replace these seats with resin aftermarket seats that have the harnesses in place. 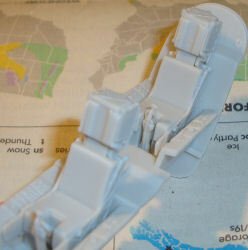 These kit seats will be perfect if you opt to add crew figures to the cockpit. Here are the front and rear instrument panels. Kinetic as done one of the nicest jobs of producing a 'glass cockpit' in styrene with the buttons surrounding the twin multi-function displays well-defined. As I mentioned above, the NACES seats took a little persuation to assemble. The kit doesn't have throttles, so you'll have to add your own. I followed the instructions for assembly and didn't have any reason to believe I was going to have issues until step 17 that wanted me to mount the main gear struts in the middle of the wheel well where the retraction arm sits, and the retraction arm was shown to mount somewhere inside the tire well itself. Actually the problems started with step 15 where you build up the walls inside the main wheel well. 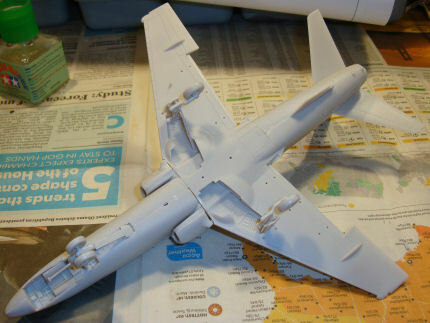 The walls mount to the upper halves of the wings but when I saw D7 going on the wrong side of a mounting strip, I decided to improvise and build the walls up in the lower wing halves where there are defined places for them. This change really worked well, but it left me with a question - what were the funnny structures at the outboard ends of the wheel wells mounted into the fore and aft walls? That question was answered in step 17. 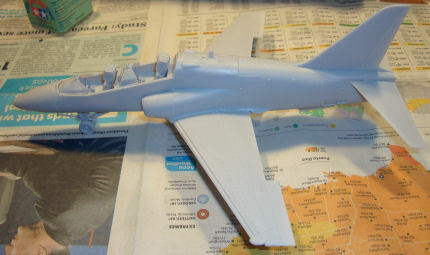 Those structures are the mounting points for the main gear as Kinetic didn't mold mounting points into the upper wing halves. The mounting does work, but it is not as solid as I'd like. 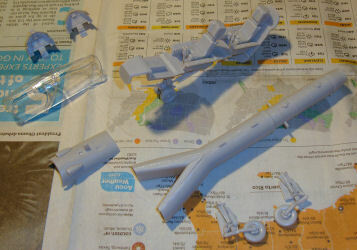 When I dry-fit the subassemblies into the fuselage, I didn't see any problems so I pressed on with assembly. As you can see in the images above, there were a few bugs that became apparent when I assembled the fuselage halves and then mounted the wings to the fuselage. The starboard intake seemed to bind on the intake trunk and you can see the resulting gap. The seam ahead of the windscreen won't close and would require filler had I opted to paint this one. Next time around, I'll focus a little more on the nosewheel well fit up there and get that resolved. 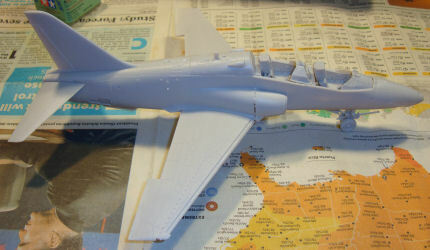 There is also a bit of a gap between the wing and fuselage on the underside, but that isn't much and is easily filled. Do not install the ejection seats until the end. 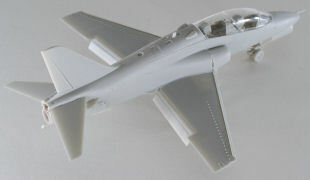 The rear seat will get in the way of the canopy if you are posing it closed like I do here. Leaving them out until the end will allow you to trim the bottom of the rear seat until you get the canopy properly seated. 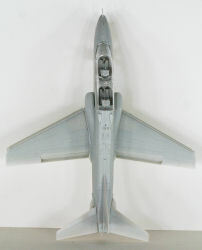 Do not mount the intakes to the fuselage sides until after the fuselage is assembled. This will allow for any adjustments in the intake trunk to avoid pushing against the intakes. 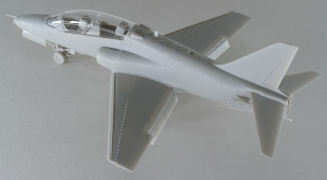 Pay attention to the front end of the cockpit assembly and ensure the nose will close completely around it before gluing. I don't know what I missed in my dry-fitting, but clearly something got in the way. Most importantly, study the instructions and the parts. I found it a bit challenging to identify a part that looks substantial in the instructions and find a tiny bit of plastic on the associated tab on a sprue tree. Yes, this is a small subject. Also be sure to feed your carpet beforehand as mine managed to get one of the main gear retraction arms. This is another nice kit from Kinetic. While there are a few minor bugs in the model, it does go together rather quickly and the detail options are quite nice. With the nice decal options from Caracal Decals (three different sets including the one mentioned above), you will have some colorful options available for your scale flightline. 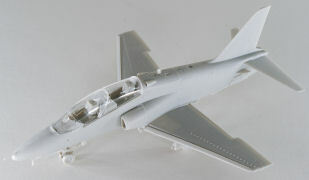 Look for a full-build (paint and markings) coming in the near future. and Stevens International for this review sample!